The General Electric UM 22C diesel-electric locomotive is equipped with a turbo charged 12 cylinder 7FDL diesel engine which is directly coupled to a 2 000 horse power DC generator. The main generator equally supplies power to six traction motors, each mounted on one axle with two wheels which are gear driven. These are mounted on three axles per bogie. The maximum operating speed is dependent on the gear ratio of the traction motor to the wheel axle. The locomotive is equipped with two driving cabs, one at each end, hence turning of the locomotive is not always necessary and can be operated from either cabs. The main cab, referred to as cab 1 is the one with the electrical cabinet, while cab 2 is the one fitted with Westinghouse equipment. The locomotive operates equally in either direction, and can haul a maximum load of 1200 tons, however the units can be coupled together to increase load capacity. The operating controls are trainlined to allow all the units to be controlled from the lead locomotive. 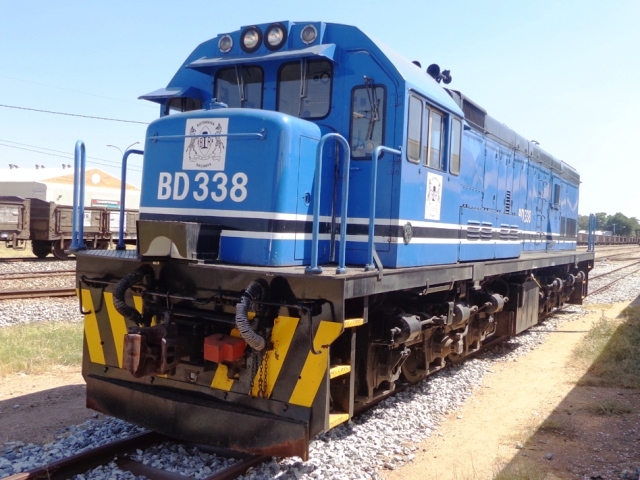 The maximum number that can be used in multiple operation is three (manufacturer), however Botswana Railways operates a maximum of two. The General Motors Model GT22LC-2 diesel electric locomotive is equipped with a turbo charged 12 cylinder 645E3B diesel engine which drives the main generator. Electrical power from the main is distributed to the traction motors through the high voltage control cabinet. Each of the six traction motors is geared directly to a pair of driving wheels. The gear ratio of the traction motor to the wheel axle determines the maximum operating speed of the locomotive. The basic locomotive is arranged and equipped so that the short hood or cab end is considered the front or forward part of the unit. However, the locomotive operates equally well in either direction. While each locomotive is an independent power source, several units may be combined in multiple operation to increase load capacity. The operating controls on each unit are jumpered or “trainlined” to allow all the locomotives to simultaneously controlled from the leading unit. The locomotive is equipped with a compressor/exhauster and Westinghouse brake system which makes it capable of hauling vehicles operating on both vacuum and air brake systems. 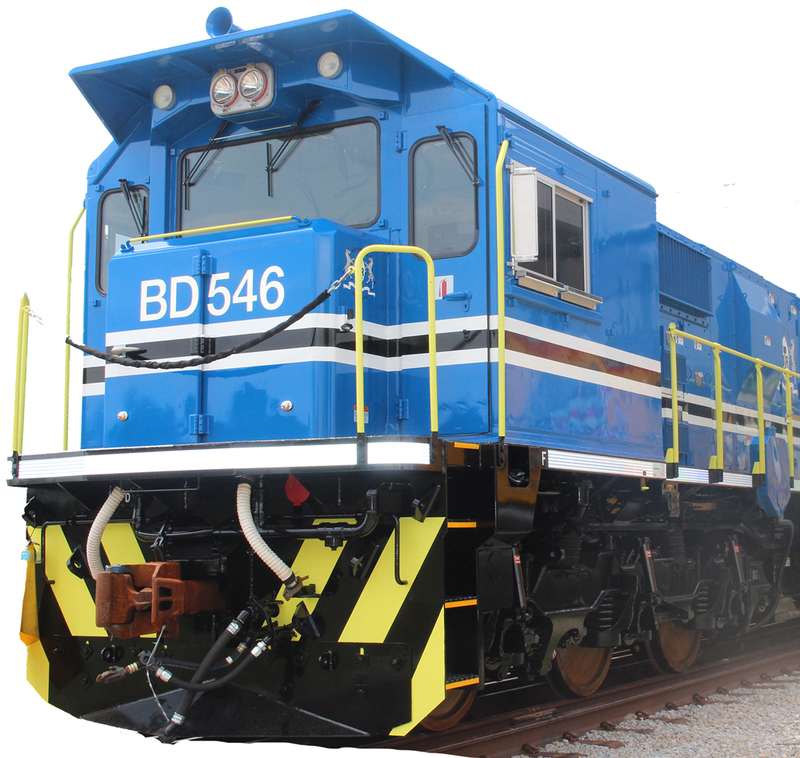 The General Electric U15C diesel electric locomotive is equipped with a turbo charged 8 cylinder 7FDL diesel engine which drives the 2 000 Hp main generator. Electric power from the main generator is distributed to the traction motors through the high voltage electrical cabinet. Each of the six traction motors is mounted on a pair gear driven wheels. The gear ratio of the traction motor to the wheel axle determines the maximum operating speed of the locomotive. The locomotive is arranged such that the short hood or cab is considered the front or forward part of the unit. The locomotive due to its design and features was specifically procured as a shunt locomotive, but can be used on mainline. The driving cab is equipped with two control stands, one on the right facing forward and the left facing back. The operator can switch from one control stand to another depending on the direction the locomotive is moving. The locomotive operates well in either direction and can haul a maximum load of 1000 tons. Several units may be combined in multiple operation to increase load capacity. The operating controls on each unit is trainlined to allow all the locomotives to be simultaneously controlled from the leading unit. 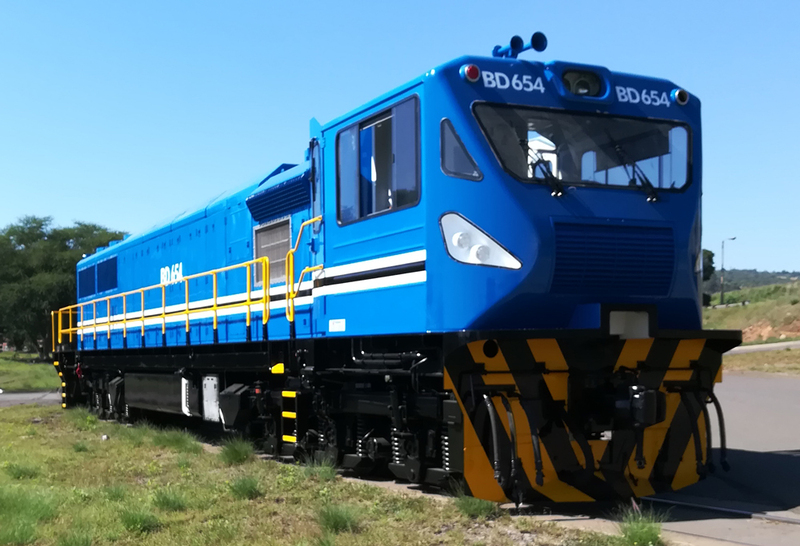 The Electro Motive Diesel Model GT42LC diesel electric locomotive is equipped with a turbo charged 12-cylinder 710 diesel engine which drives the alternator producing 3000 Hp. Electrical power from the main is distributed to the traction motors through the high voltage control cabinet. Each of the six traction motors is geared directly to a pair of driving wheels. The gear ratio of the traction motor to the wheel axle determines the maximum operating speed of the locomotive. The basic locomotive is arranged and equipped so that the short hood or cab end is considered the front or forward part of the unit. However, the locomotive operates equally well in either direction. While each locomotive is an independent power source, several units may be combined in multiple operation to increase load capacity. The operating controls on each unit are jumpered or “trainlined” to allow all the locomotives to simultaneously controlled from the leading unit. The locomotive is equipped with a compressor/exhauster and Westinghouse brake system which makes it capable of hauling vehicles operating on both vacuum and air brake systems. The Grindrod Model GL30SC-AS diesel electric locomotive is equipped with a turbo charged 16-cylinder 645EB diesel engine which drives the alternator producing 3000 Hp. Electrical power from the main is distributed to the traction motors through the high voltage control cabinet. Each of the six traction motors is geared directly to a pair of driving wheels. The gear ratio of the traction motor to the wheel axle determines the maximum operating speed of the locomotive. The basic locomotive is arranged and equipped so that the short hood or cab end is considered the front or forward part of the unit. However, the locomotive operates equally well in either direction. While each locomotive is an independent power source, several units may be combined in multiple operation to increase load capacity. The operating controls on each unit are jumpered or “trainlined” to allow all the locomotives to simultaneously controlled from the leading unit. The locomotive is equipped with a compressor/exhauster and G-brake system which makes it capable of hauling vehicles operating on both vacuum and air brake systems.